Lynette Loeppky talks with Naomi K. Lewis about what it means to tell the truth in a work of creative non-fiction. Lynette returns to her roots to celebrate the launch of Cease in Winnipeg at McNally and Robinson. Alberta Literary Awards finalists will read from their work at Shelf Life Books. Join Lynette and her fellow nominees for the celebration. 1302 – 4 Street S.W. Lynette Loeppky, Cathie Borrie and Kara Stanley read from their memoirs, discussed their work and answered questions at the Vancouver Writer’s Festival InCite Series on March 25th, at the Vancouver Central Library. Presented by the Vancouver Writers Festival together with the Vancouver Public Library. Lynette spoke with Chris dela Torre of CBC’s Daybreak Alberta about the release of Cease and the challenges of writing such a poignant and personal true story. 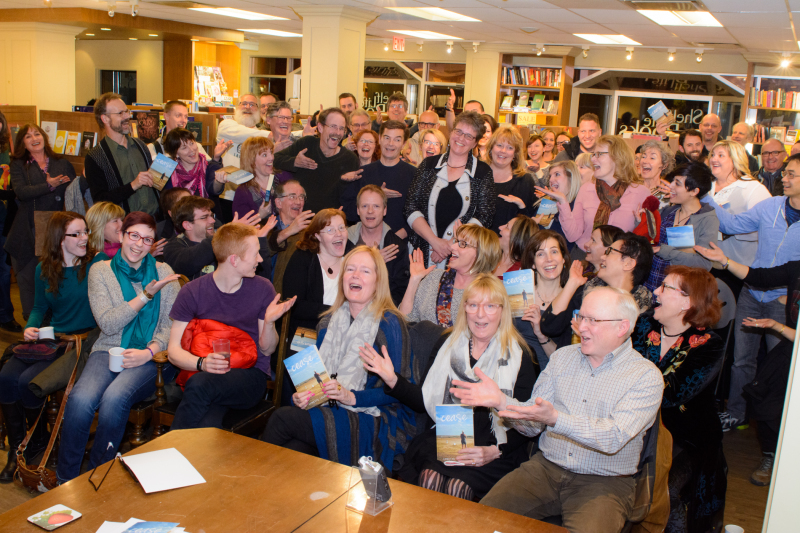 The release of Cease was celebrated at Shelf Life Books. The audience was enthusiastic and engaged. Lynette read from her memoir and discussed her work with Calgary writer and critic, Aritha van Herk. Lynette Loeppky with Aritha van Herk, Calgary writer and critic, and Randal MacNair of Oolichan Books. Lynette gave a reading and discussed the unique challenges of writing non-fiction with fellow authors Bruce Grierson, Arno Kopecky and Nancy Routley. "...thoughtful and carefully woven memoir...What sets this apart from other caregiver memoirs, is the temporal coincidence – a relationship’s end and an individual’s demise – and the questions that arise from it: Chiefly, why do we stay?" "...an unusually intimate look inside a relationship." "...Loeppky has combined stylistic excellence with raw honesty to create a gripping read." "Unique, transfixing and beautifully written." "...packs multiple powerful themes into an intense, gripping narrative."